Peanuts: Most are Carcinogenic & Pesticide-Contaminated, But There are Safe Sources! You are here: Newsletters > 2004 > December > 12 > Peanuts: Most are Carcinogenic & Pesticide-Contaminated, But There are Safe Sources! 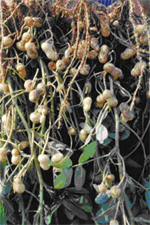 Peanuts are actually beans that grow in pods in a root system (seen here) where they mature underground. Whether in front of the TV or at sporting events, whether straight from the shell or spread over bread, Americans eat about eight pounds of peanuts per person each year. In fact, over half of the "nuts" consumed in the United States each year are peanuts! That would be good news as clean and healthy peanuts are a nutritious food choice, widely proven to help prevent heart disease and type-2 diabetes, among other benefits as you will read below. Unfortunately, though, nearly all of the peanuts consumed in the U.S. are now among the most carcinogenic and pesticide-contaminated of any snack we commonly eat. There are some clean and healthy choices -- but first you have to know where to look, what to look for, and why you are looking in the first place! For starters, the peanut (arachis hypogea) is actually not a nut at all. It is a bean -- and a peculiar one at that. It is part of the legume family, and while most of the beans found in this family grow in pods on sprawling, climbing vines, the peanut plant is a lonely bush that matures its pods underneath the ground in a root system. It is primarily due to the peanuts' direct contact with the soil that they have become harmful, and even dangerous, to your health. While actual nuts like almonds and walnuts have strong, hard shells that protect them, the legume known as a peanut has soft and porous skin. When the environment surrounding the peanut becomes warm, humid and wet -- as it does in most regions of the U.S. where peanuts are commonly grown -- a fungal growth occurs. The fungus itself is not dangerous, but the poison it releases, known as "aflatoxin," is. This cancer-causing agent attacks the liver and is one of the more deadly food-borne toxins in existence. Largely because of the regions they're commonly grown in and the fact that they're relatively easy for pests to attack and penetrate, peanuts are also one of the crops most heavily sprayed with pesticides. So the standard peanut packs a double-whammy risk to your health. According to a 2002 Harvard School of Public Health study published in the Journal of the American Medical Association, consuming a half serving (one tablespoon) of peanut butter five or more times a week can reduce the risk of developing type-2 diabetes by 20%. Harvard research also showed that that substituting peanuts and nuts for saturated fat or refined carbohydrates can reduce risk of heart disease by 45 and 30 percent, respectively. 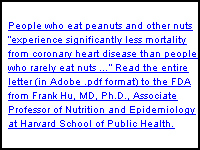 Frank Hu, MD, PhD, Associate Professor of Nutrition and Epidemiology at Harvard School of Public Health and an author of the 2002 study, says, "Given the observed inverse association between nuts and risk of coronary heart disease as well as type 2 diabetes, it is advisable to recommend regular peanut butter and nut consumption as a replacement for refined grain products or red or processed meats, which would avoid increasing caloric intake." Various other studies, such as the Iowa Women's Health Study and the Physicians Heath Study, have also demonstrated peanut butter's strong cardio-protective benefits. And in a six month study conducted by Pennsylvania State University, subjects following a "peanut diet" lowered their total cholesterol by 11 percent and the bad LDL cholesterol by 14 percent. Triglycerides were also lowered but the good HDL cholesterol was maintained. So overwhelming is the clinical evidence for these health benefits that, in 2003, the US Food and Drug Administration (FDA) affirmed a qualified health claim that peanuts and some other nuts may reduce the risk of heart disease when consumed regularly. Peanuts are also a very good source of fiber, vitamin E, potassium, folate, zinc and magnesium. A Purdue University study showed that subjects with low magnesium levels in their blood improved to normal ranges when they consumed peanuts daily. Peanuts also contain resveratrol (the substance found in red wine), flavonoids, and antioxidants, all of whose health benefits are increasingly being proven to help you prevent a wide variety of diseases. Finally, in addition to containing over 75 percent good unsaturated fat, peanuts contain the highest amount of vegetable protein of any "nut" -- vegetarians and vegans take note! The key to consuming healthy peanuts is to make sure they are USDA organic, and grown in a region where the soil is dry and aflatoxin has therefore not been reported as a problem, such as New Mexico. It is unlikely that in a typical grocery store you will be able to find peanuts or peanut butter that meets these requirements, but you can check out your local health food store. -- the #1 bestselling organic peanut butter in the U.S.! Maranatha Peanut Butter tastes considerably better than standard brands, as you will see, and is USDA Certified Organic. This means it is free of pesticides and made by farmers who only use approved materials that are completely safe to humans, animals and soil life. They must develop an organic farm management plan, keep detailed records, and have their crops inspected annually in order to remain certified. Furthermore, the nuts used to produce Marantha peanut butter only come from dry weather environments where aflatoxins have not been reported as an issue, such as New Mexico. Valencia peanuts from the dry soil of New Mexico are grown with no pesticides or harmful chemicals. The peanuts are sun-dried. No stabilizers, hydrogenated oils, sugars, artificial color, flavors or preservatives are added. The ingredients are just peanuts and some sea salt. The peanuts are poured into a large gas-flame roaster. They are then transferred into another machine to cool. After they are cooled, the nuts get transported to a room where they are crushed until butter forms. The all-natural 100% organic peanut butter is placed into jars, labeled and boxed for shipment. Maranatha Organic Peanut Butter is the top choice we found to experience all the health benefits and incredible taste of peanuts without the health risks. There are other products on the market, but again be careful to ensure they are certified organic and that they come from a dry-weather region where aflatoxin has not been reported as an issue.